Through three games, Northwestern has allowed just 16 points and is allowing 235 yards per game during a 3-0 start. The Wildcats held Stanford to six points and Duke to 10 points last week. 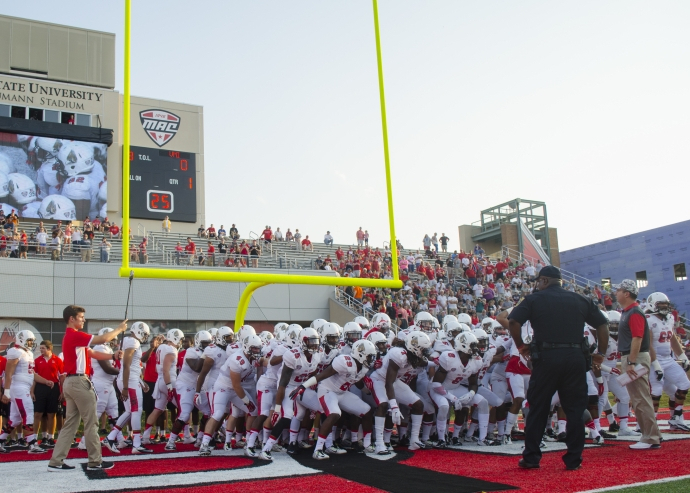 Ball State's offense will look to get off to a fast start and put some points on the board. Freshman running back James Gilbert said he thinks the team is approaching Northwestern's defense the right way. "I feel like we got a good game plan this week," Gilbert said. "We [are] still going to run the ball and do what we do, we've been doing good so far, so why stop now?" The Cardinals' offense was sparked by the addition of freshman quarterback Riley Neal to the offense. Neal entered the game last week against Eastern Michigan, leading Ball State to 28 unanswered points in a 28-17 victory. The 6-foot-5-inch signal caller finished 24-28 for 194 yards and a touchdown. He added 93 yards and another touchdown on the ground. But Northwestern has been stingy against the pass, only allowing 124.3 yards per game so far. Add running back Darian Green to the mix, and Ball State's offense has been a nice balance in a 2-1 start. The Cardinals are averaging 33 points per game. "I know they're a good, disciplined team, but my mindset is just don't beat yourself," Green said. "I believe in our offensive coordinators and coaches ... they are contributing giving us a great plan to go in there with giving us a chance to win." In the first few games, it seemed like the Cardinals would have to outscore teams to win. But against Eastern Michigan, the defense pitched a shutout in the second half. It will look to continue its improvement against a Northwestern offense that has been average, ranking 88th in the country to this point. Through the air, quarterback Clayton Thorson averages 109 yards per game, a 50.8 completion percentage and has one touchdown to two interceptions. The strong suit on the offensive side of the ball appears to come from the ground game, where the Wildcats are averaging 257 yards per game. Justin Jackson leads the attack, but Warren Long, Solomon Vault and Thorson also contribute. Despite a tough, grind-it-out approach, Northwestern has shown it can put up points, defeating Eastern Illinois 41-0 in its second win of the season. With Ball State's fast-paced offense, it appears the teams are on opposite ends of the spectrum. If the Cardinals get off to a good start and force some turnovers on defense, they will look to win what may be a low-scoring game with one of the nation's top teams. "I don't think you'll exploit anything," head coach Pete Lembo said. "You have to execute at a very high level and you have to fight for every yard that you get." The teams will kick off at 8 p.m. at Northwestern on Sept. 26.